MailEnable Enterprise Edition includes all the features of MailEnable Professional Edition and is designed for organizations, hosting companies or ISP's dealing with high volumes of mail, requiring greater control and flexibility over mail services. Enterprise Edition adds highly functional features such as: Powerful Administration - Easy to administer via the Microsoft Management Console, MailEnable has remote administration capabilities for managing server clusters ? provides easy access and the ability to administer a remote mail server like a local machine. 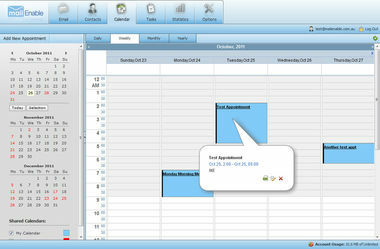 Web Administration is enhanced to allow easier management of multiple domains. Incorporates .NET web administration; Enhanced Security - Extensive security measures and authentication methods including CRAM MD5, APOP and SMTP authentication, protect your mail server from unauthorised access. Now includes additional security features; Secure Sockets Layer (SSL) and NTLM support for high level encryption; Full Featured Web Mail - Additional features such as personal calendar, public folders, spell check, quota usage display, HTML support, custom ?skins? and multi-lingual support. Now supports .NET framework; Improved Spam Protection - Enterprise Edition contains numerous anti-spam features ? with the addition of SPF, Bayesian filtering plus URL blacklist content filtering to protect your system from unwanted junk mail; Scalability & Optimised Services - Create server clusters and store user configuration data in Microsoft SQL or MySQL to upscale the capacity of your mail services. System performance improvements include message indexing and caching on configuration files to reduce resource load and dramatically improve system response times; Message Filtering - allows you to define rules and actions for messages as they pass through MailEnable. 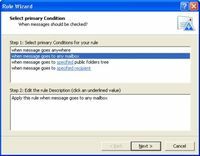 Create message filters globally or by user mailbox.